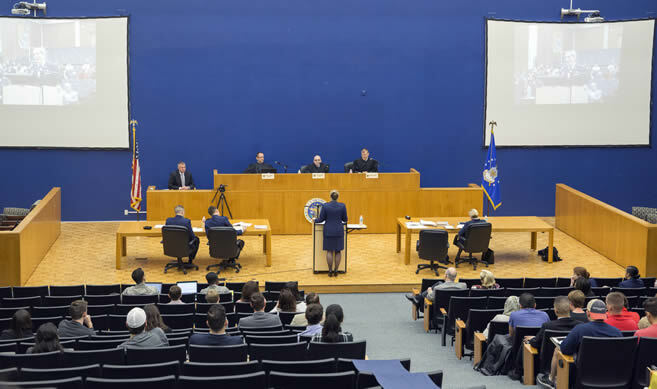 The United States Air Force Court of Criminal Appeals conducted a hearing on April 6 in Krost Hall at the University of Houston Law Center. April 17, 2017 - The University of Houston Law Center was the site of a U.S. Air Force Court of Criminal Appeals hearing recently in Krost Hall. The hearing was led by Chief Judge Col. Rodger Drew, a 1987 Law Center Alumnus. "It was an honor to have this esteemed Court come to the University of Houston Law Center," said Jim Lawrence, director of the Blakely Advocacy Institute. 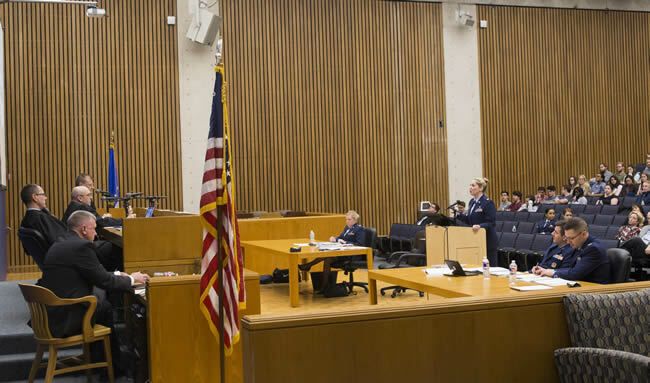 The Court heard the case of U.S vs. Blatney, where the issue on appeal is whether a military judge erred by suppressing the appellee senior airman Chad Blatney's act of unlocking his cellular phone, as well as the contents of his phone pursuant to the fifth amendment.